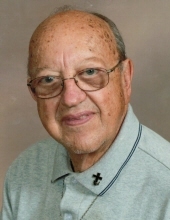 Robert E. Keister, 83, of Freeport died Thursday February 7, 2019 in his home and is now in heaven with his wife and the Lord. He was born January 21, 1936 in Orangeville, IL the son of Charles and Ruth V. (Deemer) Keister. On December 21, 1957 he married Virginia M. Veach at First Lutheran Church in Freeport. Virginia passed away January 9, 2015. Robert was a 1955 graduate of Dakota High School. Robert was employed at Burgess Battery for 22 years followed by Newell for 21 years. He was a member of Prince of Peace Lutheran Church in Freeport where he was also on the church council. Robert was a Rock City Fireman for 12 years; volunteer for DORS for 25 years, sponsor for youths at Rock Grove Lutheran church for many years and served in many other volunteer organizations. He is survived by his daughter Joy (Douglas) Zozri of Kissimmee, FL; two brothers Donald (Iona) Keister of Ocala, FL and Lawrence (Karen) Keister of Rockford, IL; three sisters Esther (Randy) Bolen of Machesney Park, IL, Deloris (James) Vincent of Freeport, IL and Enola (David) Troxell of Lena, IL; three grandchildren and ten great-grandchildren. Robert is preceded in death by his parents, wife and two brothers Gary and Chuck. To send flowers or a remembrance gift to the family of Robert E. Keister, please visit our Tribute Store. "Email Address" would like to share the life celebration of Robert E. Keister. Click on the "link" to go to share a favorite memory or leave a condolence message for the family.